We are trying to update this as much as possible because once we are India it sounds like we won't have a lot of free time! We have had an amazing day today! 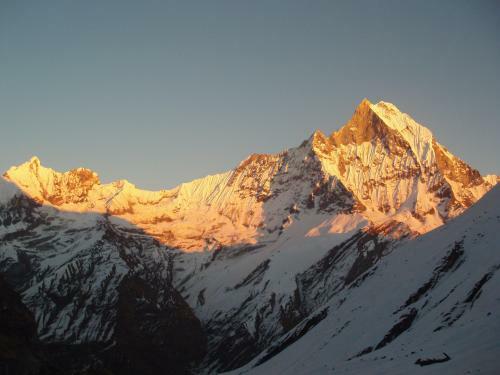 It began at 5am to trek up Sarangkot, a foot hill in the himilayas. I lost count of the number of stairs we had to go up, but it was worth every one of them for the most spectacular views we got at the top (photos will hopefully be on facebook!) Chris thinks we were up 1600 metres. We took our seat and I munched on some shortbread and we watched the sun rise over the himilayan mountains and turning Annapurna a stunning pink. After spending a while at the top it was time to make our way down. We went the untouristy way and we plodded on for two hours down the mountain, through the forest, trying to not fall and through very small villages sat on the side of the hill. It was such a lovely walk and we got back into town for about 9.30 where we went to a cafe near by our hotel and I munched on a full english (yes, I know its not very cultural, but I had been thinking of the most perfect breakfast I could have after being up for four hours and this was the nearest thing to it) and Chris had an Italian omlete. Which came with cheesy garlic bread, which was so garlicy I can still smell it on him. Mmmm! Afterwards was time to prep ourselves for our paragliding! Now, at this point I should point out that Chris has been very excited about this since he booked it yesterday. And... I was very nervy about it. But, I thought- what the hell, you're not going to get the chance to paraglide in such a fantastic location ever again. So I bit the bullet and jumped on the minibus towards the take off point. After very briefly meeting my instructor, Danom, I was strapped on to him and he told me to run as soon as the wind takes the parachute. And thats what I did. It isn't very human to go running off the side of a 1600 metre hill, so when the wind picked us up I was very grateful and even screamed WOOO... until I looked down and saw how high we were!! The first few mins were amazing and I am so glad I went. We kept on climbing higher and higher, going round in circles. You could see so far- I can't explain how fantastic it was. Chris on the other hand took to it like a duck to water. He was doing such cool acrobattics with his instructor and didn't vomit at all! Tomorrow we move on to the national park and I'm pretty sure there will be no PCs to update you on our travels. Love you all lots and look at the photos- I'm pretty sure they have uploaded now.